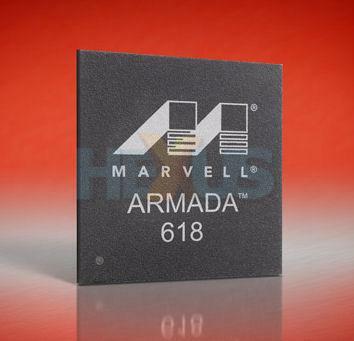 Low-power chip-maker Marvell teased its ARMADA family of application processors back last autumn and now, on the eve of Mobile World Congress, it's launching the flagship chip - the ARMADA 618. The 618 will go up against SoCs like Snapdragon, Tegra and OMAP as the chip for high-end smartphones. "Featuring a gigahertz CPU, 1080p full-HD video, 3D graphics, the industry's fastest LP-DDR, and optimized power for longer battery life, Marvell's ARMADA 618 application processor represents a dramatic leap forward in high end, multimedia smartphones," said Ms. Weili Dai, Marvell's co-founder GM of its computing business Unit. With the maximum size of smartphone screens being around four inches, however, we have to ask why 1080p video is even necessary. The answer lies in Marvell's strategy of offering a common platform for device makers to make mini-notebooks, e-readers, tablets and so on. We spoke to Shyam Krishnamurthy, head of Marvell's cellular applications and communications processor business, and asked him what differentiates ARMADA chips from all the other SoCs out there. "Every building-block we put into our application processors is very mobile Internet friendly," he said. The ARMADA 618 supports Linux, Android, Windows Mobile and full Adobe Flash. This one is single-core, but dual and triple core versions are expected soon.